Why an EDL Aircraft Shelter? 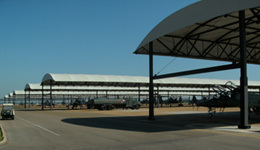 Extreme temperatures on the flight line can reach 150 degrees without an aircraft shelter. Cockpit instruments are not protected from direct sunlight which can turn into high maintenance costs for aircraft units. EDL delivers and installs metal aircraft hangars which help protect the aircraft and personnel who spend a lot of time on the flightline. With an EDL aircraft shelter, you reduce extreme weather temperatures, extending the life of valuable components such as cockpit instruments. Aircraft shelters also significantly decrease the deterioration of coatings, transparencies, composites and wiring insulation breakdown from heat and moisture. EDL military aircraft covers and aircraft shelters not only protect the aircraft, but they also protect aircraft crews from direct exposure to the sun which can result in skin cancer or cataracts. 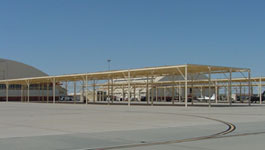 Each EDL Aircraft Shelter is designed and engineered to exact specifications which meet all requirements listed in the United Facilities Criteria (UFC) for each military base in the continental U.S. and overseas. EDL Constructions engineers design each shelters metal or fabric in accordance with the International Building Code. From the inception of a project, EDL engineers and specialists are available to assist and recommend the proper design to withstand specific loads at your location. Need to relocate due to BRAC decisions? How about taking your existing aircraft shelters with you! EDL aircraft shelters are not permanent structures. 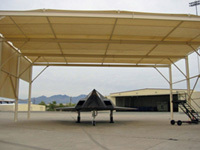 Our metal and fabric shelters are easy to set up and remove in the event your aircraft units need to be relocated. EDLs conservative design requires no special tools to assemble or disassemble them.